Select Fabricators, Inc. awarded a US patent for its single door, double magnet enclosure door system. Canandaigua, NY USA: Select Fabricators, Inc. was awarded in May 2015, a US patent for its non-radiating single door, double magnet sealing system. Part of the complete RF EMI shielding design for Select-A-Shield portable test enclosures, Select Fabricators developed the patented (US Pat. No. 9,029,714) single door system to streamline the production process and reduce the amount of conductive fabric. The resulting cost savings are included in their latest pricing. The new door system facilitated the inclusion of internal and external vestibules, easy-to-use tabletop test enclosures as well as additional custom designs. The single door, double magnet closure system can be specified to open in or out for ease of entry. Two parallel strips of the magnet along three sides of each door creates a tight double seal, minimizing the probability of RF leakage due to adjacent gap openings that allow RF to pass directly into the enclosure. This door system is an improvement over zippered or conductive hook & loop doors which take longer to open, may not be conductive and typically require higher thresholds. Select-A-Shield RF / EMI enclosures are constructed with RoHS compliant, durable, lightweight, silver/ copper/nickel, NovaSelect™ fabric; SFI’s proprietary highly conductive material. 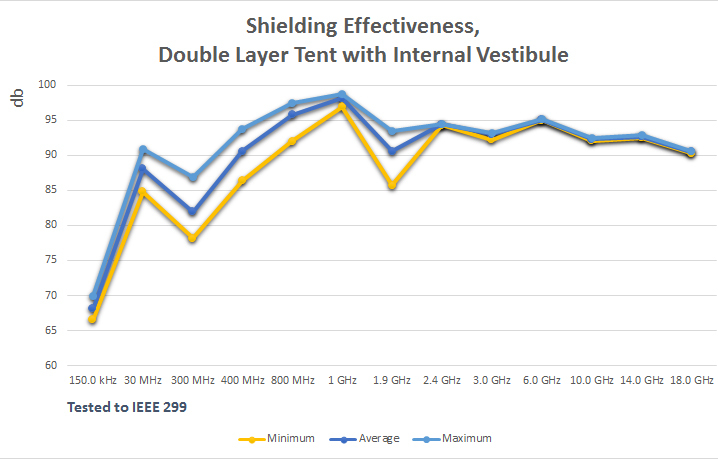 An independent test on a high attenuation tent with internal vestibule using the single door, double magnet seal system, resulted in a minimum of -85.7dB attenuation from 400 MHz to 18GHz when taking measurements through the walls, doors, and penetrations at multiple locations. Flexible neodymium double strip magnets can be bent and flexed without affecting their performance and are magnetized in a matched pole configuration to provide even alignment. The magnets are encased in NovaSelect material and are easily opened and closed with user-friendly alignment tabs. The NovaSelect material, with a surface resistivity of 0.006 ohms-per-square used to seal between the magnets provides a very effective door closure system with repeatable shielding performance. 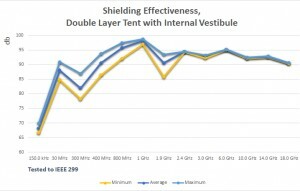 Select-A-Shield RF / EMI products are ideal for numerous applications including wireless device development and testing, secure communications*, EMC pre-compliance, medical and aerospace equipment shielding, cellular and computer forensics and RFID shielding for commercial and industrial settings. This is the third patent awarded to Select Fabricators. The first patent, US Patent No. 8,723,053, is for Select’s USB forensic pouch design that allows signals and power to be brought in or out of the pouch without compromising radio silence. The second patent, US Patent No. 8,530,756, covers the double door, single magnet sealing system used in standard Series 100 frame Select-A-Shield portable enclosures. Founded in 2000, Select Fabricators, Inc. excels in the development of RF / EMI solutions including shielded enclosures, pouches, and curtains, as well as the procurement of state-of-the-art materials, research, design, manufacturing, fulfillment, and production to stringent quality standards with complete project management. With capabilities including industrial sewing, heat sealing, ultrasonic welding, pad printing and cleanroom operations, SELECT delivers a wide array of solutions to the aerospace, forensics, homeland security, law enforcement, industrial, medical, military and wireless communications industries. Select Fabricators, Inc., a privately owned company, conveniently located in Canandaigua, NY USA near major transportation routes including the NYS Thruway. SELECT’s main facility consists of over 19,000 square feet of flexible manufacturing, warehouse and office space with a Class 1000 Fed. Std. 209 ISO Class 6 cleanroom and Class 100 Fed. Std. 209 ISO Class 5 curtained area.